This finder mounting shoe / bracket is compatible with Altair and Starwave finder scopes and Red Dot Finders. Althought usually included in finder scope kits, it can be ordered separately for use on multiple telescopes. The mounting shoe features 2x clamping screws for extra rigid hold, which is best for auto guiding and keeps alignment better than standard 1x clamping screw systems. Made from black matte anodised machined aluminium. The UNIFBR bracket fits most telescopes, allowing for hole orientations running perpendicular or parallel to the optical axis. The cross-slotted base has two 30mm length slots at 90 degrees with 5mm internal width for M4-M5 mounting screws. 2x M4 button head hex screws are included for attachment to most telescopes. The hex screws fit into the recessed slotted mounting holes and do not protrude, so they do not foul the finder base. Compatibility: Fits Altair Wave EDT 115 APO, Altair Wave 102 EDT APO, Starwave SW80ED, SW102ED and SW110ED 3" focusers. 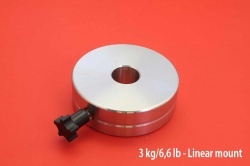 Also fits most other telescopes and can be easily modified filed or drilled to make it fit, being made from aluminium.